Goldman Thibodeaux and the Lawtell Playboys rock the house at the Liberty Theater in Eunice, Louisiana. 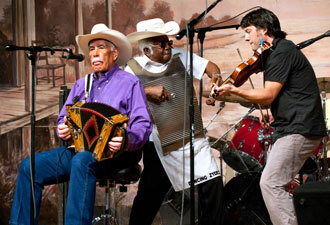 Musical surprises are a hallmark of Rendez-vous des Cajuns on the Saturday before Mardi Gras. It's carnival time in Louisiana! Time for fun and foolishness in New Orleans' French Quarter. It's time for parades through city streets and beads flying off floats into the waiting hands of shouting children of all ages. “Throw me somethin', mister!” That's what Mardi Gras is all about, right? Not in Louisiana's Cajun country, where Mardi Gras (happening in 2012 on Tuesday, February 21) means a whole different way to celebrate. 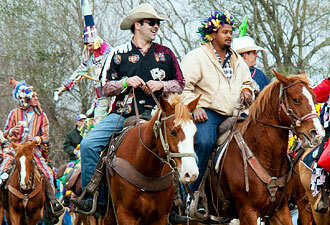 On the prairies of southwest Louisiana and at the Prairie Acadian Cultural Center, Mardi Gras means Courir du Mardi Gras, the Mardi Gras run, with masked riders on horseback, homeowners rewarding musicians with onions and chickens, and a big pot of gumbo at the end of the day. Early on Mardi Gras morning, people in rural areas don homemade costumes, masks, and tall hats based on old French capuchons. They mount horses, climb into wagons, and follow their capitaine from house to house, where the capitaine asks the homeowner's permission to visit. If entry is granted, revelers charge the house, singing and dancing and begging for gumbo ingredients. Riders collect flour, rice, vegetables, and the occasional live chicken as they make their rounds. The day ends in town with music, revelry, and gumbo for all. Folks do things a little differently here, and the Prairie Acadian Cultural Center in Eunice, Louisiana reflects this rich and colorful way of life. Exhibits and programs share the story of Canadian French exiles — Acadians — who made their way to Louisiana after their expulsion from English Canada beginning in 1755. As the Acadians became Cajuns, they adapted to their new land and their new neighbors in a great cultural exchange. Today's Cajuns are known for their own dialect of French, their distinctive food and music, and their heartfelt hospitality. 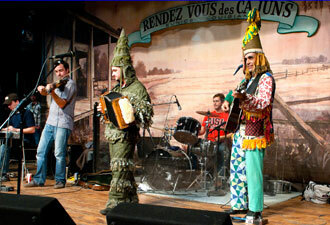 The Prairie Acadian Cultural Center does the tradition proud with free Saturday afternoon demonstrations of the best of local culture: crafts, cooking, and a chance to dance to a Cajun band. Volunteers might even step in to teach you the proper way to two-step or waltz! Every Saturday evening at 6 pm, the Liberty Theater next to the Prairie Acadian Cultural Center teams up with the park to present Rendez-vous des Cajuns, a live Cajun and zydeco music show. Locally known as “the Cajun Grand Ole Opry,” the show is the centerpiece entertainment of the restored 1920s theater, originally billed as “Southwest Louisiana's Premier Temple of Amusement.” Rendez-vous features stories and jokes (often told in Cajun French – other patrons will happily translate the punchlines), the unforgettable music of south Louisiana, and a dance floor for those who want to do more than just tap their toes. Whether it's Mardi Gras or just any Louisiana Saturday night, the Prairie Acadian Cultural Center is a great place to share a good time. The center, northwest of Lafayette off Interstate 10, is one of six sites managed as part of Jean Lafitte National Historical Park and Preserve. Admission and most programs are free throughout the park.